Tell me about the shoot you had this week in Seattle? Had a great shoot this week for Intellisphere. This is the fourth time this year I have flown to the west coast to film and oversee a green screen doctor interview. Previous stops were in Portland, Oregon, Salt Lake City Utah, Houston Texas and now this shoot in Seattle. Most of the shoots center around Oncology and doctors giving information about how they administer a drug, what benefits they see from it, the side effects and how it compares to other drugs in the field. 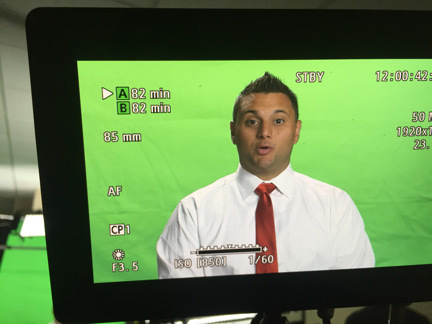 Having shot green screen interviews for this company many times before, do you use the same protocol or is every shoot different? What was unique to this shoot was we had the doctor tell us his thoughts, reading a script via a teleprompter. In addition we placed a confidence monitor under the teleprompter and had someone changing slides with information as he spoke so he could reference charts and graphs while he was speaking. In terms of lighting the greenscreen, technology is so great nowadays that even a poorly lit greenscreen can be keyed out. I do always try to light the screen evenly and I look at the waveform in my camera to see where the light falls off the screen behind the subject. I find that 4-bank Kino-flo’s one on each side provide a nice, even light that covers a large green screen. I’ve lit green screens with arri fresnels and HMI’s before, but I always ask my local gaffers for Kinos as a first choice. The other great thing about the Kinos is that they don’t soak up a lot of electrical power, so there’s less concern about knocking out power in the corporate office settings these shoots usually take place in. Coming from the east coast, what gear did you bring? I brought with me my Canon C300 camera, and three lenses that covered focal lengths from 16mm wide to 200mm tight. I almost always shoot these with the 70-200 2.8F L series lens, but I bring other options just in case. I bring a Sachtler FS8 tripod with me because it has a nice wide tripod carrying case that I can also fit my boom pole and senheiser 416 Boom mic. 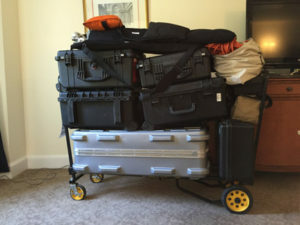 In addition with my luggage, I pack a small HD, DP7 reference monitor and my audio bag, which consists of two lavelier microphones, a hand-held microphone and various attachments for clipping the microphones to subjects. So you had to fly across the country, how did you decide what gear to pack and what gear to rent? It’s become pretty standard for me to bring this package and rent whatever else is needed. In terms of this shoot, the gaffer we hired had a huge 3 Ton grip truck that was super well organized with everything you could ask for. Our gaffer had all types of lights, stands, green screens and ways to mold light. We also rented a local teleprompter and operator and the confidence monitor, as these are large items that are hard to travel with. I must say we have done an excellent job selecting gaffers, as in every city we’ve gone too, we’ve had a quality 2-man team to light the green-screen quickly without issue. Our team in Seattle has lots of commercial and movie experience, including work on the film Draft day. My teleprompter op also was very experienced. She was handed an updated script right before we were about to roll and quickly went through it with annotations and notes based on past experience so the doctor could say everything properly without needing to stop do the prompter. This is especially critical with people such as doctors who are not used to reading off of teleprompters and it was very much appreciated by ASL. Why did you decide to use that specific camera? 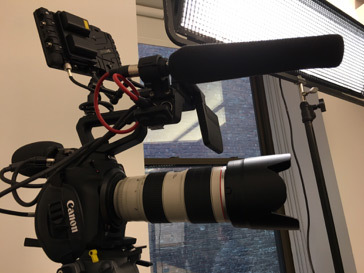 In terms of camera we own two Canon C300s and find it to be ideal for interviews and corporate filming. It is very modular, and has a terrific cinematic quality, that will make the most hard to follow pharmaceutical talk, at least pleasant on the eyes. How did you decide what lighting gear and set up you were going to use? Power, having an even key and having the light on the green screen and the light on the subject be of similar strengths all factor in to how we light these. For these shoot we had a powerful Kino ME-80 as our main source. With a light that powerful, all you need is a bounce board to fill out the fill sign. Bounce boards are great, as they produce a nice soft result that is pleasing to the eye. In addition, it’s important to have backlight to separate your subject from the background. The focal length of the 70-200 lens also helps separate the subject from the background, but we used a Kino Diva on the hair and shoulders of our subject. A lot of corporate clients don’t like it when there are white shiny spots on the subject from back light being too harsh or hitting skin too directly. I try to be mindful of this and not have too harsh of a backlight that mainly touches the hair and shoulder to provide that separation from the background. How many people did you use in your crew? In this scenario it was 2-man grip/gaffe team, a prompter operator, and myself. A client production manager was also on set and assisted with changing slides on the confidence monitor. Were there any unexpected situations or problems you ran into with this particular shoot? 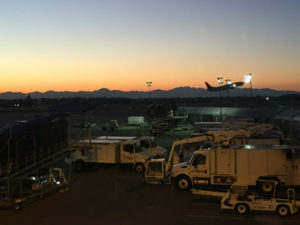 Why did you make the decision to fly in and out of Seattle on the same day? Work and Family. Got to get back to my two newborn and 2 and a half-year-old before my wife’s head explodes. Doing this definitely did allow me to have a Tuesday as I landed at 6am Tuesday as opposed to getting in late Tuesday night. However, I think to took me about 3 days until I felt like myself again. Did that affect the shoot at all? No effect. Still had three hours to kill before my flight out and managed to get some delicious Thai food and see and explore a beautiful area just miles from downtown.